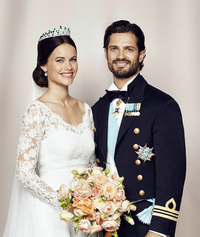 On Saturday June 13th, Prince Carl Philip married Miss Sofia Hellqvist in a beautiful ceremony in the Stockholm Palace Church. It was not the grandest of Royal Weddings, and the choice of music did perhaps leave a little to be desired, yet it was indeed a delightfully romantic and very personal wedding. It was obvious that the young couple had been part of the entire planning down to the smallest detail, and there was no doubt that this was a love match if ever there was one. The entire Swedish Royal family was of course present, as were many of the Danes, Norwegians and Dutch and a sprinkling of Royals from other countries. Unusual was the presence of four “single” Queens, Margrethe II, Maxima Mathilde and Sonja, all there without their husbands. Carl Philip’s four aunts, Margareta, Birgitta, Désirée and Christina were there as were his great-aunt Marianne Bernadotte, 91, and distant cousin Dagmar (Bernadotte) von Arbin, aged 99. The Bernadottes often live to a grand age, including Kings Gustav V (92) and Gustav VI Adolf (90), Princes Oscar (93), Sigvard (94), Carl Johan (95), Lennart (95) and Carl Jr (92). The record holder so far is Dagmar von Arbin’s aunt, Elsa (Bernadotte) Cedegren (102). At the wedding banquet, there were nice speeches by H.M. the King and by the father of the bride, as well as a glorious and memorable one by the bridegroom himself, amazingly overcoming his publicly confessed problems with dyslexia. And then, the new Princess surprised everyone by standing up, brides don’t usually do this, adressing her husband and the guests, a talk that ended with a lovesong, performed by some of her friends, that she had written herself. Bravo! Present was of course also the groom’s younger sister, the very pregnant Princess Madeleine and her family. Two days later, on 15 June, she went into labour and was safely delivered of a son, a new Prince for Sweden. Three days later, the King announced that his new grandchild had received the names and titles H.R.H. Prince NICOLAS PAUL GUSTAF of SWEDEN, Duke of ÅNGERMANLAND, one of Sweden’s 25 historic provinces (Landskap). Of these several, including Ångermanland, which is way up north, have never had a Duke or a Duchess. Others include Blekinge, Öland, Bohuslän, Medelpad, Härjedalen, Norrbotten and Lappland. No lack of potential Dukedoms or Duchessdoms, should the Stork pay additional visits to the Royal family of Sweden. Three Royal weddings in just five years ... Too much for the Swedish monarchists? No way, especially since we will probably have to wait for another quarter of a century for the next one! It was however definitely too much for the Swedish republicans, for whom the month of June 2015 was indeed a black one.